Switzerland—arguably the world's leading tax haven—faced tough questions from a UN human rights body in Geneva today over the toll that its tax and financial secrecy policies take on women's rights across the globe. Prompted by a submission from CESR, Alliance Sud, the Global Justice Clinic at NYU School of Law, Public Eye and the Tax Justice Network, the UN Committee mandated to oversee compliance with the Convention on the Elimination of All Forms of Discrimination Against Women (CEDAW) by probing Switzerland on how it will ensure that its financial secrecy policies and corporate tax rules are consistent with its commitments to promote gender equality and sustainable development abroad. Every year, governments lose huge volumes of revenue when corporations and wealthy individuals avoid paying their fair share of taxes by shifting their funds to countries like Switzerland, where they can be held in secret, taxed at very low rates, or exempt from taxation altogether. These tax revenues are essential for the fulfillment of fundamental human rights. When government coffers are drained, the resultant cuts in public programs and social protections hit women hardest, as they often are forced to fill service gaps with their unpaid care work. Moreover, when wealthy individuals and corporations dodge their dues, women bear the brunt of states’ increased dependence on consumption taxes. As a party to CEDAW, Switzerland has committed to avoiding policies that are detrimental to the rights of women, whether at home or beyond its borders. It is likewise obliged to prevent private sector conduct that might undermine women’s rights extraterritorially by helping to prevent corporate tax abuse and enable other countries to raise and retain revenues needed to fulfil human rights. Over a third of the world’s total unrecorded offshore financial wealth is estimated to be held in Switzerland, which ranks number one on the Financial Secrecy Index. Cross-border tax abuse deprives developing countries of some 500 billion dollars in revenue each year—more than twice the total amount those states receive in official development assistance from industrialized countries. In countries such as India and Zambia, the revenue lost to Swiss-facilitated tax abuse represents a significant proportion of spending on women’s rights and essential social services such as health. 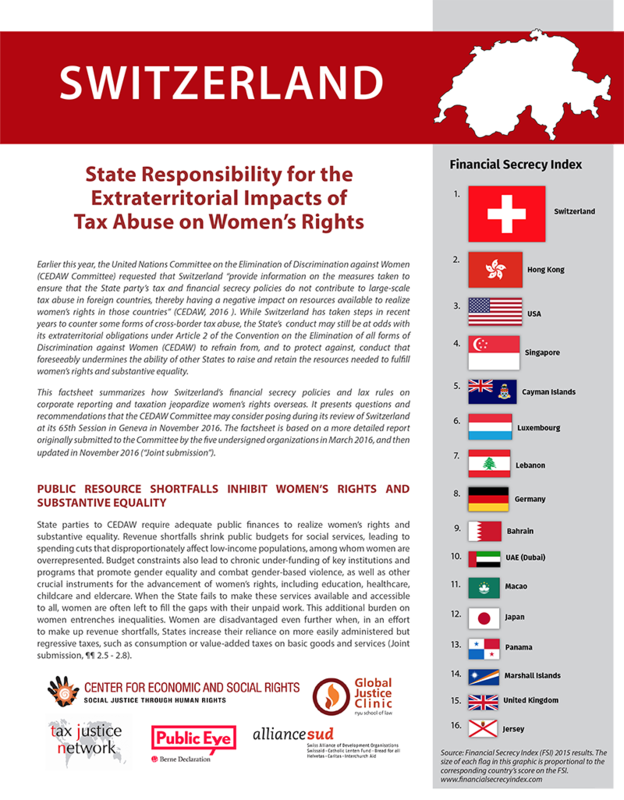 In a landmark submission to CEDAW and accompanying Factsheet, the aforementioned civil society organizations call on Switzerland to regularly report on the impacts of its financial secrecy policies and lax rules on corporate tax on the mobilization of revenues for women’s rights in other countries. The organizations urge Switzerland to incorporate key legal and policy safeguards – in particular a process of independent and periodic impact assessments – to ensure that Switzerland does not enable tax abuses that undermine the ability of other countries to mobilize the resources they need to fulfil women’s rights. Spurred by this submission, the CEDAW Committee expressed concern that Switzerland’s financial secrecy and corporate tax policies are adversely affecting women’s rights and sustainable development overseas, and asked the government how it will harmonize these policies with its commitments under the SDGs and related commitments on financing for development. In its prepared response, Switzerland recognized the harm that tax abuse can have on sustainable development and gender equality, but stopped short of committing to assess and address the role its own policies play in facilitating this corrosive phenomenon. CEDAW’s concluding observations and recommendations to Switzerland are expected later this month. Its scrutiny of Switzerland’s role as a tax haven is an important step forward in the expanding efforts of the international human rights system to hold governments accountable for the human rights impacts of their tax and financial policies, within and beyond their borders. A robust recommendation to Switzerland to abide by its international obligations to women’s rights could prove a critical milestone in the fight against the longstanding injustice of tax abuse.